A refrigerator is a huge investment for your home, and it’s hard finding models that are made with U.S. parts and by the U.S. workforce. We dug in to help you make that process a little easier. Below are our recommendations for the best fridges made in the USA (or, mostly, as you’ll find out), along with tons of details about each one and the factors we considered in our research. Overall, we could not find any fridges that are made from 100% American materials by a 100% American workforce – which is super disappointing! It seems like most major manufacturers are choosing to get lower-cost materials from overseas. However, we did find several bright spots among certain models from fridge manufacturers where materials are either >80% U.S. based or are completely assembled in America, supporting local economies. GE, Sub-Zero, Whirlpool, and Maytag all have some models that meet those criteria. GE has the most models that are almost entirely U.S. made, with options in their French door, side-by-side, and top freezer series. We have more details below on our favorites! Here are additional details about all of our top picks, including the notable features, what we liked, and what we didn’t like about each one. 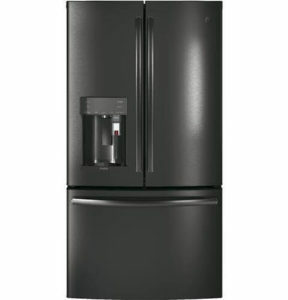 The Cafe Series fridge from GE is an amazing appliance that is made from 90% American parts and 100% American labor. 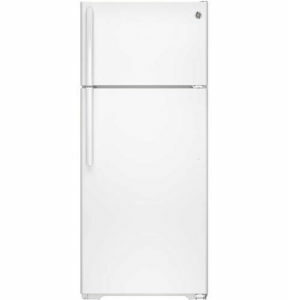 The size of this built-in fridge model is pretty comfortable at 42″ wide, which is good for any small to mid-size family. We really like the temperature control in this model as well – it has an easy to read gauge and the temp is pretty even across all compartments, so you don’t get any unexpectedly cold or warm spots. One of the “cooler” features is the ability for this fridge to connect to Wi-Fi, so it can send real-time performance feedback to GE and also work with smart home assistants like Amazon Alexa and Google Home. The sleek stainless steel design and classic side-by-side look makes a great addition to any kitchen. Sub-Zero is the cream of the crop in refrigeration. Their products are built with one simple idea in mind – keep food fresher, longer. Their built-in over/under fridge and freezer combination is no exception, with some of the most advanced food preservation technology on the market. A microprocessor inside each model monitors the temperature and climate at every section in the fridge and automatically adjusts as needed. In addition, each one is also equipped with an anti-microbial air purification system, which scrubs the air in the fridge every 20 minutes to rid it of any traces of mold or other toxins. In terms of storage space, this BI-30U model has over 13 cubic feet of space in the fridge section and over 4 cubic feet in the freezer. These are just a few of the features that make this over/under fridge great, but it will cost you with a heavy (but worth it for some) price tag. We were really impressed with the features of this French door fridge from GE, which is made of 84% U.S. materials and from 100% U.S. facilities and labor. Along with the typical LED lighting, humidity-controlled drawers, and other features that you come to expect from high-quality fridges these days, this GE model has a couple of different specs that really make it stand out. One is that the fridge is ADA compliant, meaning that it’s accessible and easy to open by people of varying ability. It also has a couple of nifty features with an optional second ice maker and an advanced water filtration system. This affordable 17.5 cubic foot top-freezer model from GE is made with 81% American materials and is exclusively assembled in American factories. We really like it for the level of quality you get for just a few hundred dollars out of pocket. The white color also fits in almost any kitchen. Inside, it comes equipped with three shelves (two adjustable) and two drawers in the main compartment, along with additional storage space in the door. The freezer has two shelves inside and additional door space as well. We found the temperature control to be very straightforward, and it held up well to several tests. Other experts seem to think it’s reliable too, rated #1 in quality and dependability by The Stevenson Company, who specializes in market research for appliances. Overall, this is a great buy if you’re on a budget, but don’t want to skimp on reliability. We are really impressed with this Whirlpool bottom-freezer refrigerator, particularly with the spacious interior and great features to help with temperature control and food preservation. The shelving on the interior is well sectioned to fit a variety of foods and each shelf is shaped to contain spills so they don’t leak down to other areas of the fridge and you can clean up easily. A feature we really love is the automatic defrost technology in the freezer – it monitors the freezer environment for frost, and only runs when it needs to take care of any buildup starting to happen. We also found the temperature management in the fridge portion to be very suitable, along with designated drawers for fruits, vegetables, and deli meats to keep each in the right environment. 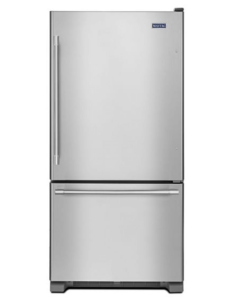 Although not all materials are sourced from the U.S., this Maytag stainless steel fridge is designed, engineered, and assembled in Amana, Iowa. 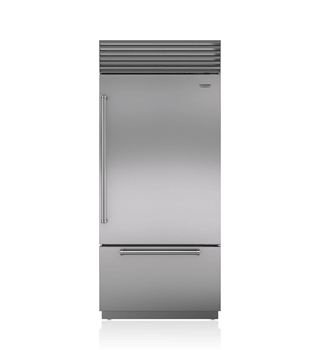 The fingerprint resistant stainless steel is what really makes this fridge stand out from the stiff competition. It will look great in pretty much any home design! This fridge also comes equipped with great LED lighting, crisper drawers to help preserve fruits and vegetables, and very even temperature control in both the fridge and freezer portions. The size of each section is pretty standard at 15.6 cubic feet and 6.5 cubic feet, respectively. 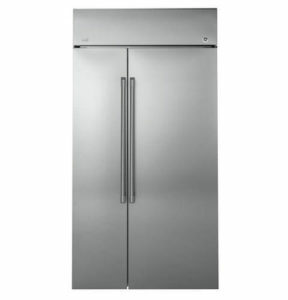 Overall, this is a very solid stainless steel fridge for a pretty reasonable price tag. 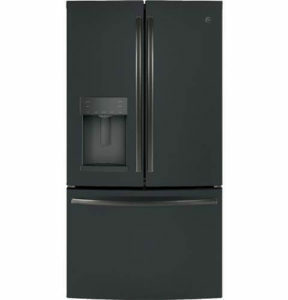 This GE Profile Series fridge comes with all the bells and whistles, including a unique Keurig K-Cup brewing system right in the front door! Just heat up water (button on the front of the fridge or you can schedule it through the app), plug in a K-Cup and go, getting hot coffee in your mug almost instantly. It is made of 84% U.S. materials and from 100% U.S. labor. Another outstanding feature is the drawers in the fridge – they have adjustable temperature settings! The setting you choose is designated with colored LED lights in the drawer. This model can also connect to Wi-Fi to send real-time performance feedback and alerts, and connect with your smart home assistant. Your refrigerator has to be able to fit in your kitchen comfortably, but also hold all of the food and other items you need to store in it. Cubic feet is typically how fridges are measured for size, but you can’t exclusively rely on just that number. You have to subtract out space for shelving, water filtration systems, and other things on interior. Bulky shelving, for example, can really take up a lot of valuable fridge space. We looked for fridges that didn’t waste any of their volume with bulky and unnecessary interior features. Temperature control is quite possibly the most important decision factor for a fridge – that’s its job! A good fridge should be able to keep an even temperature throughout all sections of the fridge. No matter if you take a temp reading in the back of the fridge, in the front, on the left, or on the right, the reading should be the same. We also looked for fridges that had easy to use temp control panels. Style is always important for such a central piece of your kitchen. We looked for refrigerators with fairly neutral colors and a variety of styles that go well in different styles of kitchens. Occasionally you need to shuffle stuff around. Fridges with easy to use, adjustable shelving help you customize your space to fit the food and drinks you need to preserve. Refrigerators and freezers eat up a lot of energy and can end up costing you on your electricity bill each month if you don’t choose the right one. 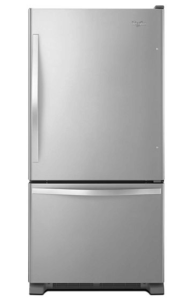 We only chose fridges that are ENERGY STAR certified and extremely efficient so you can save money. We want to make sure you’re getting the best fridge for your money, so we eliminated several fridges from our consideration where we felt like the quality did not live up to the cost.